The recent trend toward simplicity in decor can be summed up in a single color: white. The versatile hue has the power to highlight certain features of your home without competing with others. Plus, it lends a pristine yet calming effect to every room, from the kitchen to the bath—and not just indoors. White paint is a classic choice for exteriors, providing a crisp and clean first impression. While some exterior paint colors are better suited to specific locations or architectural styles, a white or off-white shade works on everything from Shingle-style beach retreats to modernist townhouses. White also creates an exceptional backdrop for contrasting architectural details. 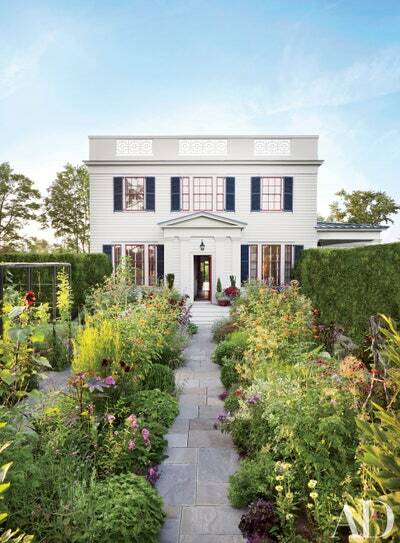 Rich blue shutters and red mullions accent the white exterior of architect Peter Pennoyer and interior designer Katie Ridder’s Millbrook, New York, home. architect Nikos Moustroufis and designer Isabel López-Quesada used a pale blue paint on the window frames and shutters of a Greek island compound, echoing the hue of the sky and sea. Interior designer Michael S. Smith distinguished a half-timbered house in Beverly Hills, California, by painting the timbers a warm tan hue to contrast with the white stucco and brickwork. For a contemporary home, nothing looks quite as sleek as an all-white exterior. Expanses of glass break up the enameled aluminum panels that make up the exterior of a home in Luxembourg designed by Richard Meier & Partners Architects. The benefits of white paint go beyond its fresh look. A coat of Ivory or Cloud can make small houses look bigger, and unlike darker colors, neutral shades don’t have the risk of fading from years of sun exposure. Ready to give your house a bright makeover? These homes from the AD archives stand out in polished white, with styles from clapboard to modern stucco, contrasting brightly against brick, ivy, or glass elements.